On this special day that the church has set aside as the Immaculate Conception of Mary we need to talk about the "s" word...Sin. The evolution of defining sin and the concept of original sin led to the belief that Mary was unstained by sin from birth. Original sin is a concept that comes from an interpretation of the story in Genesis that we read in the first reading tonight. I would like to suggest that the 'original sin' interpretation is a misunderstanding of what the story is actually teaching. The doctrine of the Immaculate Conception is based on this misunderstanding of the Genesis story. Therefore there is a problem with the Immaculate conception doctrine if in fact it is based on a misinterpretation of scripture. The misinterpretation involves seeing the Genesis story as a telling of an actual event in history. It views Adam and Eve as the original people created by God. Here are some problems with looking at the story as a retelling of an actual event: 1)Who was there recording this actual event? 2)Can snakes actually talk? 3)If the original people would have not eaten the forbidden fruit then sin would have never come into the world. I'm sure you can think of other problems. The doctrine of the Immaculate conception carries these misunderstandings further because it says Mary is the new Eve who was conceived in the sinless garden of her mother's womb and was untainted by original sin. This immaculate conception of Mary allows her to be the perfect candidate to become the mother of Jesus. There is a theological desire to clean up the sinful world so that the Son of God can enter. This is sort of like cleaning your house before entertaining guests.This points to the problem that has plagued the church over the centuries..too much emphasis on the human ability to make things perfect for God. When we do this there is no room in the equation for allowing God to actually be with us the way we need God with us. But this is what happened with the immaculate conception doctrine. The house needed to be immaculate before the most special guest, Jesus entered the world. Mary needed to be free from original sin. But guess what? Jesus doesn't mind dirt, clutter or sin. In fact it says in the scriptures that Jesus came to be with the sinners not the saints. It is less about us trying to get things in perfect condition before God can enter the world and more about receiving God openly and willingly the way Mary did. I think there is heavy theological baggage connected to thinking we have the ability to make things immaculate for God. I would like to offer another understanding of the story in genesis that will help us be released from this theological baggage so that the doctrine of the immaculate conception can be reframed and even renamed. This alternate interpretation of the story in Genesis comes from the book Discovering Old Testament Origins by Margie Ralph. She teaches that this story in Genesis is written in the literary form called myth. The definition of myth is an imaginative and symbolic story about a reality which is beyond comprehension. The reality beyond comprehension in this story is the common experience of suffering. So the writer of the story after wrestling with the common reality of suffering came up with this imaginative symbol filled story that points to a connection between sin and suffering. The plot of the story is: there is a place where there is no sin (a beautiful heavenly garden) then there is sin (people going against the spiritual order by eating the forbidden fruit) and then there is suffering (pain in child birth, struggle to have food and shelter, physical death) So the theme of the story is sin causes suffering. And it is important to note that the story ends here. Let's unpack the symbols in the story. If we view the message of this story in this way there was no original sin that we need to free Mary from. The question of this story is not where did sin come from? The question is why do we suffer? This interpretation of the story shows sin as a given. We as humans all have the capacity to go against the moral and spiritual order. Because we have this capacity and because we have all acted upon this capacity, there is suffering. The consequence of the choice of sin is suffering. Applying this different interpretation of the story to Mary, means that for her along with all people, sin is a given. When we understand the genesis story in this way we no longer need an immaculate conception. What we need and what I think is more relevant, is an understanding that Mary had a reception of the immaculate. Mary received Jesus who was unstained by sin and who changed the paradigm. Now the story does not end with sin then suffering. Mary's reception of Jesus gives the story a new ending but doesn't forget where the story left off. Jesus enters the world with this sad ending of sin leads to suffering. Jesus who is God dwelling with us came into a sin filled world and endured horrific suffering so that sin and death no longer have the final say. Jesus suffered, died and overcame death in his resurrection. So what does that mean for us? I think we like Mary need to work on being receivers of the the immaculate. We need to receive this gift of Jesus so that we can face our capacity to choose against the spiritual order. We need to receive Jesus who can dwell with us when we face suffering and who can empower us to make choices that are life giving instead of life destroying. We do not have to carry the theological baggage of making things immaculate before entertaining the idea of receiving Jesus as the special guest or of receiving Jesus into our imperfect sin filled world. What we have to do is to receive this immaculate gift of Jesus so that we can be transformed from one who has the capacity to choose against the spiritual order into one who accepts and is empowered by the spiritual order so that suffering and death no longer are the end of the story but are now the part of the story that can be faced with the promise of new hope and new life. So I suggest a renaming of this feast day. Not the feast of the Immaculate Conception but the feast of the Reception of the Immaculate. Check out the 60th photo of Mike Hasky's shots at the SOAW procession and others. The association has also called for an end to mandatory celibacy and for the ordination of women. The leadership team of the Sisters of Mercy of the Americas, one of the largest groups of Catholic sisters in the western hemisphere, issued a similar statement of support for Bourgeois on Nov. 28. One of the Irish priests’ association’s cofounders, Redemptorist Fr. Tony Flannery , a popular author and retreat director, is himself under Vatican scrutiny according to press reports from earlier this year. Flannery was ordered to stop writing and speaking and to go to a monastery for a period where he would “pray and reflect” on his situation. Following is the complete statement from Ireland’s Association of Catholic Priests. The Association of Catholic Priests (Ireland) is saddened and disappointed by the dismissal of Maryknoll priest Fr. Roy Bourgeois from the priesthood and from his religious congregation, and his excommunication from the Church that he has served for almost half a century. We believe that this type of action, ordered by the Congregation for the Doctrine of the Faith and implemented by the Maryknoll Order, is unjust, and ultimately counter-productive. Dismissing people because they have sincerely held views that are contrary to those of the Vatican, but which are widely shared by the Catholic faithful, will not end discussion and debate on these topics. In fact it will only serve to highlight the urgent need to face the problems around ministry in the Church. 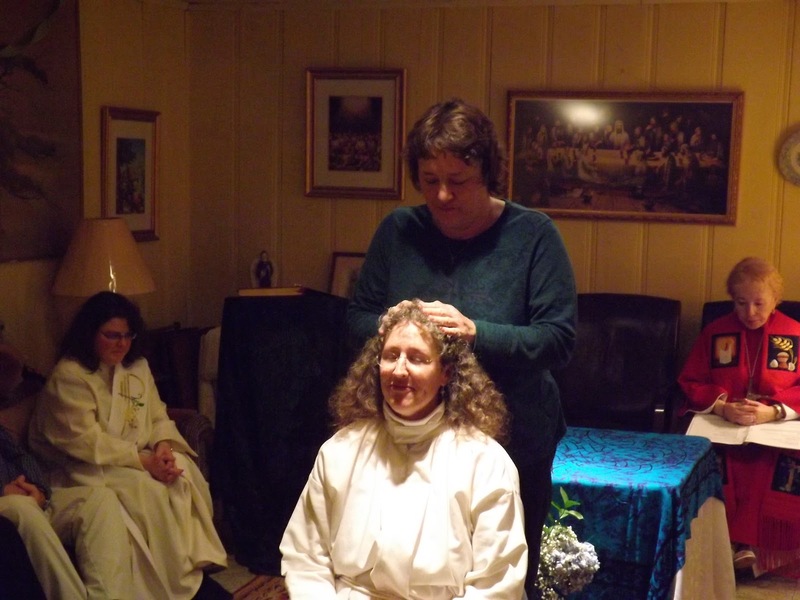 Participants in a year long ‘listening process’ in the diocese of Killaloe, a mainly rural diocese in Ireland, expressed the opinion that the ordination of women should be openly discussed, particularly in view of the projected shortage of priests in the next few years. Surely this is yet another of many examples of the sensus fidelium calling for change so that, in future, the Eucharist can be available to the Church community. We call on the Congregation for the Doctrine of the Faith to cease this type of abuse, to restore Fr. Bourgeois to the full exercise of his ministry and to allow for open and honest discussion on issues that are of crucial importance for the future of the Church. Photos coutesy Bob Watkins. 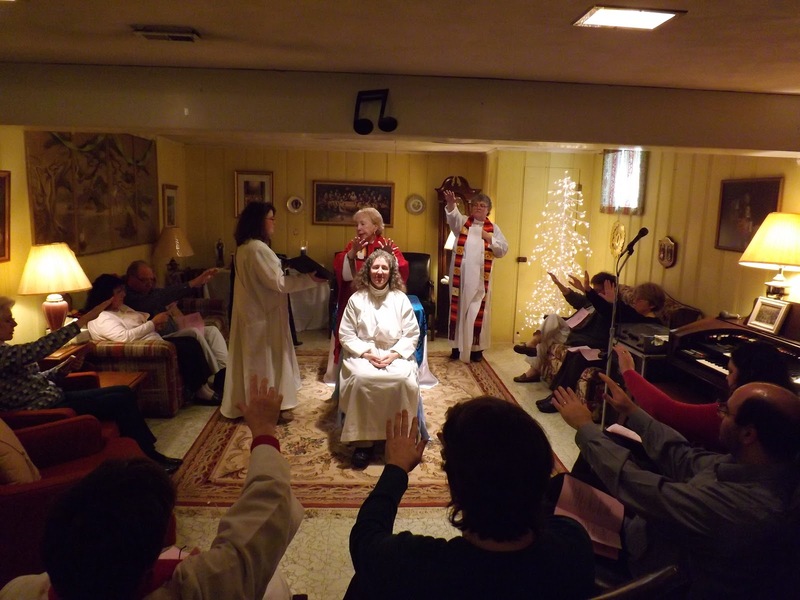 Bill has been banned from celebrating public liturgies after co-presiding at this liturgy with Janice. tambourine for saving her people from oppression. steadfastly greeted peacemakers at the PCC table on Ft. Benning Rd. 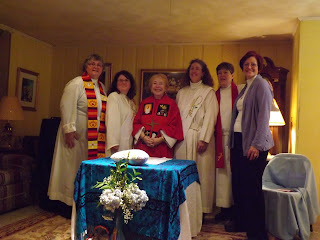 Ministries, Roll Away the Stone and Women’s Ordination Conference. The Coalition also sponsors an information table on Ft. Benning Rd. CHICAGO (Reuters) - "A 92-year-old Wisconsin Jesuit has become the latest Catholic priest to be punished by church authorities for celebrating Mass with a woman priest in violation of church rules, a Jesuit spokesman said on Wednesday.Father Bill Brennan, a Milwaukee-area peace activist who has done missionary work in Central America, celebrated Mass last month in Georgia with Janice Sevre-Duszynska of the Association of Roman Catholic Women Priests. Though Brennan remains a Jesuit and can still celebrate Mass and hear confessions with other Jesuits, he can no longer celebrate Mass or other sacraments publicly, according to Jeremy Langford, spokesman for the Society of Jesus, known as the Jesuits. Women are forbidden by the church to become priests, but some have been ordained and celebrate Mass outside of the official church. Pope Benedict XVI reaffirmed the church's ban on women priests this year. Catholic clergy who support the women can face sanctions. The Vatican Congregation for the Doctrine of the Faith dismissed Roy Bourgeois, 74, from the priesthood in October, citing his participation in the 2008 "invalid" ordination of Sevre-Duszynska and in a "simulated Mass," according to the Catholic News Service. The Archdiocese of Milwaukee and the Wisconsin Province of the Jesuits mutually agreed on the sanctions against Brennan, Langford said. "The Province did not approve or sanction the event, and regrets Father Brennan's participation in it," the Province said in a statement. Langford said that the Wisconsin Province had no plans to take any further action against Brennan, who is retired from active ministry and living in a Wisconsin retirement home and was not available for comment. "Sometimes in our lives we have to trust our conscience and bring about the consequences," Brennan told the Milwaukee Journal-Sentinel. "I wasn't trying to show off for the ladies." Sevre-Duszynska told Reuters that Brennan exemplifies the best of the Jesuit tradition, including that he "is able to understand the suffering of women who are called to the priesthood and are denied the priesthood by the church and by the hierarchy." "I think this is a bullying tactic. And I think it's shameful. It certainly is not what Jesus would do," she said of the sanctions against Brennan. Brennan worked as a missionary in Belize and Honduras for 16 years and then returned to the United States as a teacher at Jesuit-run Marquette University High School and as pastor at St. Patrick Church in Milwaukee, according to a 2007 Catholic News Service article. Five years ago, at 87, Brennan traveled to Cuba as an act of civil disobedience against the U.S. economic blockade, delivering humanitarian and medical supplies to the Cuban people, the article said." "A 92-year-old Milwaukee Jesuit is the latest American priest to be sanctioned for celebrating the Catholic Mass with a woman priest in violation of church teaching. Father Bill Brennan, a longtime peace activist, has been ordered not to celebrate the Eucharist or other sacraments publicly, or to present himself publicly as a priest by the Archdiocese of Milwaukee and his religious order, the Society of Jesus. It comes three weeks after Brennan celebrated Mass with Milwaukee native the Rev. Janice Sevre-Duszynska during an annual protest at what was historically known as the School of the Americas at Fort Benning near Columbus, Ga.
Brennan, who remains a priest and lives with other retired Jesuits in a Wauwatosa retirement home, said he knew he risked censure when he celebrated the sacrament with a woman priest. "Sometimes in our lives we have to trust our conscience and bring about the consequences," said Brennan, a Wauwatosa native who taught at Marquette University High School beginning in 1968 and spent 17 years working in Latin America. "I wasn't trying to show off for the ladies," he said. Fellow peace and social justice advocates voiced disappointment in the censure. And Sevre-Duszynska called it "outrageous" and Brennan "prophetic." "Bill has exemplified with his life the fruits of the spirit," she said. "He has worked for justice with the oppressed and marginalized, and for the liberation that Jesus teaches in the Gospel." In the Catholic Church, the local bishop - in this case Archbishop Jerome Listecki - confers the "faculties" priests require to serve publicly in a geographic area. Jesuit spokesman Jeremy Langford and Listecki's chief of staff, Jerry Topczewski, said it was a joint decision to withdraw Brennan's faculties for public ministry. Unlike Bourgeois' sanction, the move does not appear to have prompted a Vatican review, at least for now. Both the Jesuits and the archdiocese said they planned to take no further actions against the elderly priest. Brennan, who was arrested during a protest at Fort Benning in 2011, is one of two Milwaukee-area priests who have been sanctioned, at least in part for their actions there. A 75-year-old Franciscan priest and peace activist, Father Jerry Zawada, was suspended by the Franklin-based Franciscan Friars Assumption BVM province after celebrating Mass at Fort Benning with Sevre-Duszynska in 2010 and 2011. His case is pending before the Vatican, said the Franciscan provincial, Father John Puodziunas. Zawada, who served previously in the Tucson diocese, said he's had no assignment since his suspension. 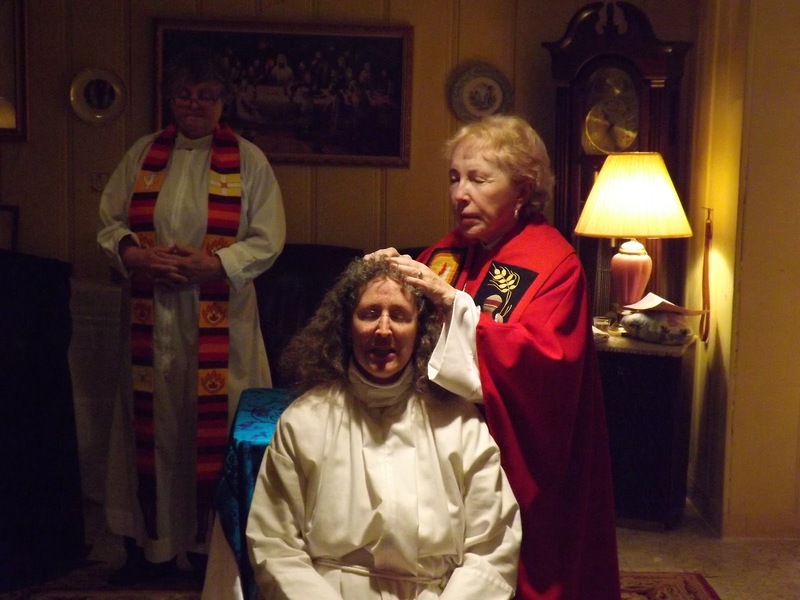 The Catholic Church prohibits the ordination of women. Sevre-Duszynska, of Lexington, is ordained in the Association of Roman Catholic Women Priests, which represents about 124 priests and 10 bishops around the world. The group claims legitimacy, saying the bishop who ordained its first women bishops stood in apostolic succession - the line of Catholic bishops who stretch back to Jesus' apostles. The Vatican rejects that argument. 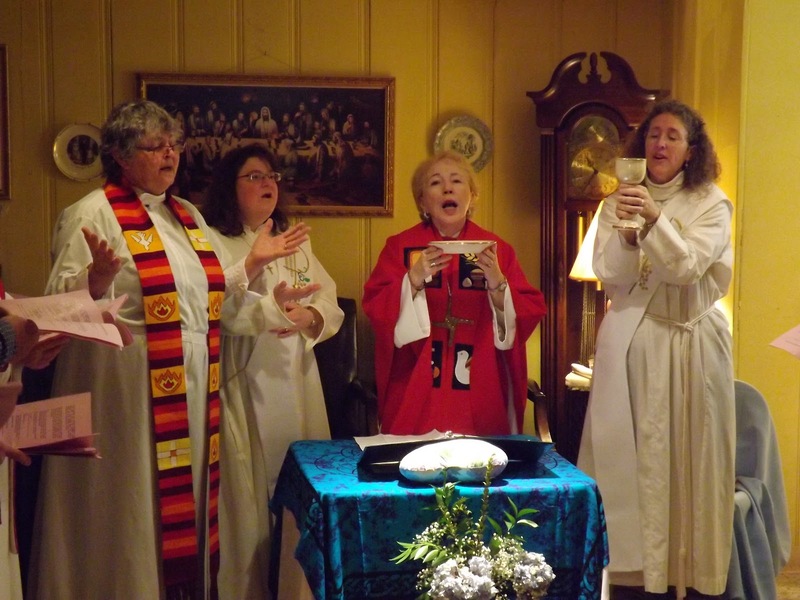 The ordination of women in the Catholic Church is highly controversial, though a majority of Catholics appear it to support it - 59%, according to a 2010 New York Times and CBS News poll. 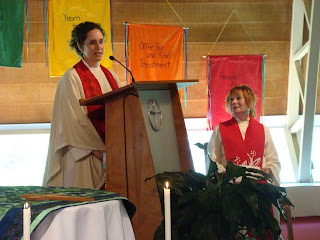 Theologians have long debated the legitimacy of the ban, and advocates for women priests often are dealt with harshly. In 2008, the Vatican decreed that women who seek ordination and those who ordain them face automatic excommunication from the church. And in 2010 it listed the attempted ordination of women as a grave sin on par with pedophilia and heresy. Brennan said his decision to celebrate Mass with Sevre-Duszynska grew not out of some "wild-eyed liberal" protest or heady theological research, but from his deep admiration for his own mother. He recalled as a child of 9 hearing his older brother tease her, suggesting that "for a woman she was pretty intelligent." "I'll never forget the look on my mother's face," said Brennan. "She knew we were teasing, but it wasn't funny. "We never did that again." Janice Sevre-Duszynska, arcwp and Bill Brennan, a Jesuit co-preside at liturgy in GA.
"A Catholic priest who participated in a eucharistic liturgy with a woman priest last month has been ordered to no longer celebrate the Mass or perform any other priestly duties. 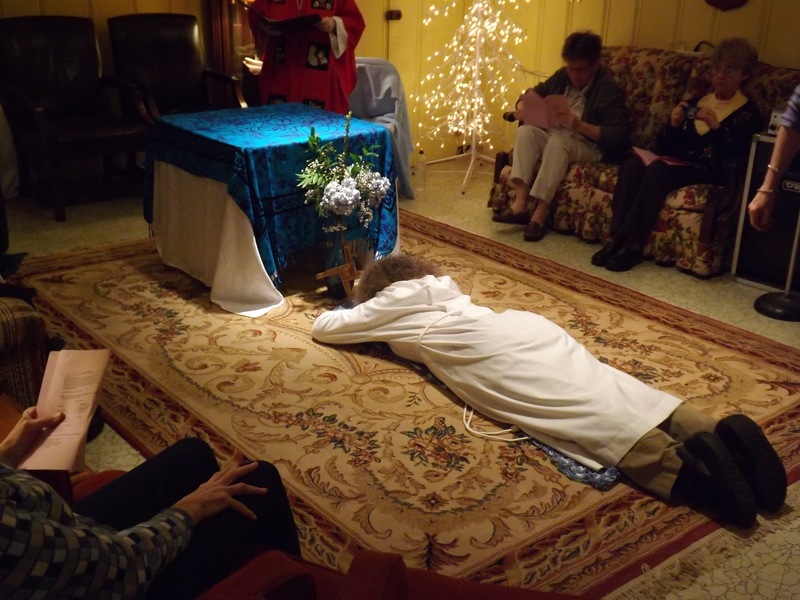 Brennan, a retired parish priest and former missionary to Belize, participated in a liturgy Nov. 17 with Janice Sevre-Duszynska, a woman ordained in the Association of Roman Catholic Women Priests movement. Brennan said he was hesitant to confirm the news regarding his loss of faculties because he was also ordered not to talk to the press. "I'm risking my existence in the Jesuit order by talking to you," Brennan told NCR. "But if I've committed a serious sin, [the archbishop] is supposed to be responsible for condemning me ... he's supposed to stand up and be responsible for that." Not leaving the Milwaukee area "for any reason" without his superior's permission. Brennan said he hasn't had any formal communication with Listecki. Jeremy Langford, the director of communications for the Jesuits' Chicago-Detroit province, which is merging with the Wisconsin province, said in a statement Monday the order removed Brennan's priestly faculties "after conversation with the Archdiocese of Milwaukee." 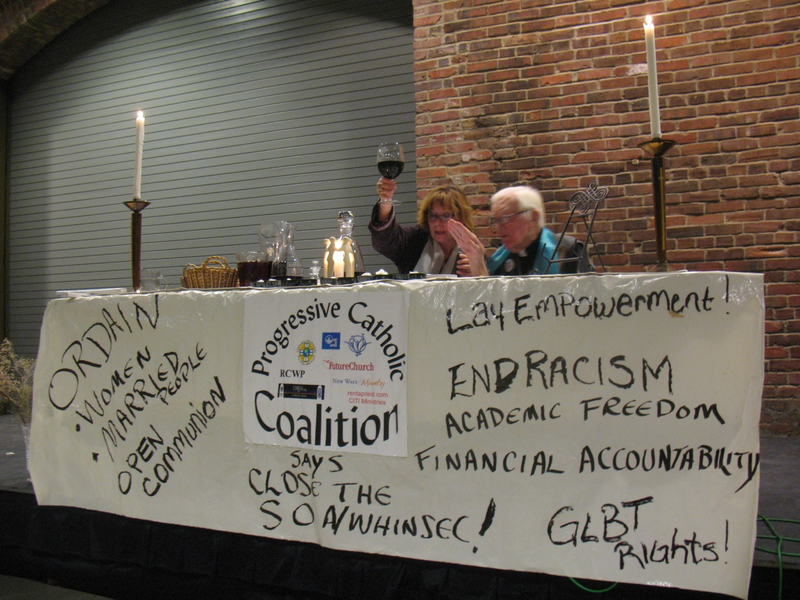 The Jesuits "did not approve or sanction" the November eucharistic liturgy and "regrets Fr. Brennan's participation in it," read the statement. "The Wisconsin province has no plans to take any further action," Langford said in an interview, calling Brennan a "wonderful Jesuit" who has "fought for great causes his whole life." Julie Wolf, communications director for the Milwaukee archdiocese, said the restrictions on Brennan were a "mutually agreed upon decision" between Listecki and Brennan's Jesuit provincial, Fr. Tom Lawler. Brennan likened his support for women's ordination to support for women's suffrage: He remembers that at one time, his mother was not able to vote. "I was born in 1920," Brennan said. "All the while my mother was carrying me and six months after, she could not vote. That's the real initiative in my attitude toward women's ordination." Brennan said he understands arguments that women do not have a right to ordination and said ordination is a "privilege that is granted to men." "Why isn't it granted to both?" the priest asked. "And the fundamental approach that I have is that, after all, women have an eminent role to play in the work of creation of children with men. What about the sanctification process? Don't they have any share in the preaching of the Gospel?" The Vatican labels the ordination of women in the Catholic church as a grave offense and says participants are excommunicated latae sententiae, or automatically. Pope John Paul II's 1994 letter Ordinatio Sacerdotalis effectively forbade discussion of the issue, saying the church's teaching on the matter was to be "definitively held by all the Church's faithful." Before deciding to participate in the November liturgy, Brennan said he discussed the matter with Lawler. The invitation to join Sevre-Duszynska at the liturgy was causing him a "real, genuine conscience problem," Brennan said he told Lawler. "I'm not trying to defy the church," Brennan said he told Lawler, adding that he sees women's ordination as a legitimate question. "Why is it that this privilege of celebrating the Mass and preaching, why is that exclusively a male privilege? Where do we get that? Isn't that worth discussing?" Lawler told him not to assist at the liturgy, Brennan said. "At the time, I was still struggling to try to decide what I wanted to do, because obviously I knew I might end up outside the Jesuit order," Brennan said. "But I just felt this was an earthy issue, and you can't cover it over with spiritual or authoritarian dictates." Roy Bourgeois, another longtime priest who supports women's ordination, was notified of his dismissal from his religious order, the Maryknoll Fathers and Brothers, over the same issue Nov. 19. Bourgeois, who served with Maryknoll for 45 years, first came into controversy with his order after he participated in Sevre-Duszynska's ordination in the Womenpriests group in 2008. Roman Catholic Women Priests is an international initiative that ordains both men and women. It counts among its members more than 150 women who have been ordained priests and bishops by the organization since it began in 2002. 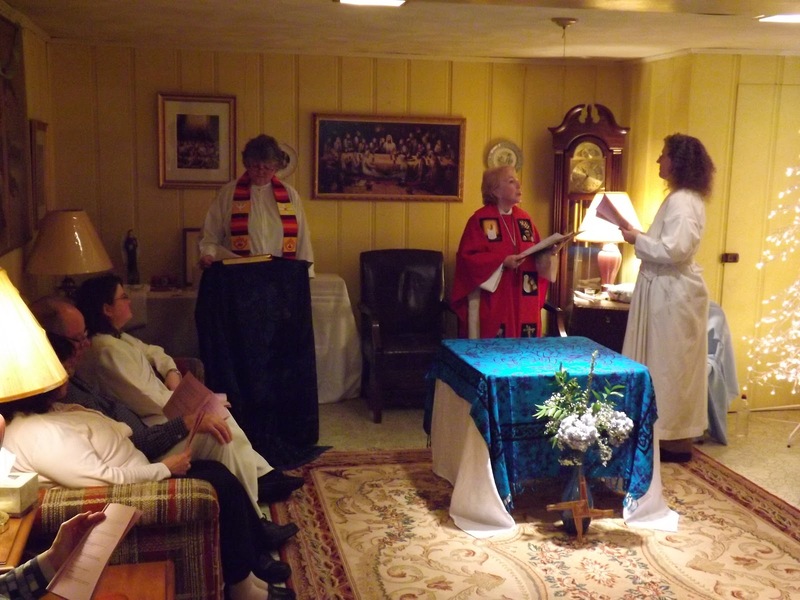 Brennan co-presided at a liturgy with Sevre-Duszynska during the annual gathering of SOA Watch, a group founded by Bourgeois in 1990 to protest a U.S. Army training school at Fort Benning, Ga., formerly known as the School of the Americas. The SOA Watch gathering, which takes place in Columbus, Ga., each November, calls for the closure of the Army school, now known as the Western Hemisphere Institute for Security Cooperation. The school in the past has been implicated in human rights abuses in Latin America. Sevre-Duszynska said the idea to ask Brennan to participate in the liturgy initially came at last year's SOA Watch gathering, where she had celebrated a similar liturgy with Franciscan Fr. Jerry Zawada. Sevre-Duszynska had remembered meeting Brennan at the 2010 SOA Watch gathering, she said, when the two were part of a group of 29 people who were arrested outside the gates of Fort Benning for stepping out of a designated protest area. 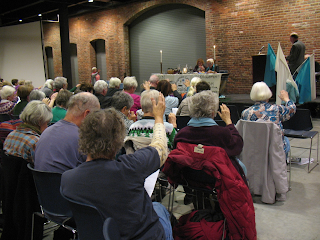 The liturgy at this year's event was dedicated to people who risk arrest for issues of conscience, "who have devoted their lives to bringing the Kin-dom here on Earth," Sevre-Duszynska said. A Milwaukee-area native, Brennan served for 17 years in Belize when it was still a British colony, known as British Honduras. 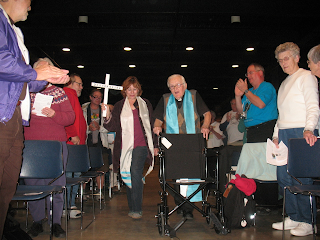 Following that, he served in Milwaukee-area parishes, primarily with Latino communities. Asked whether he was worried about further restrictions being place on him for his support of women's ordination, Brennan said: "When you have a conscience problem, you have to follow your conscience and then take the consequences. I have to take the consequences." National Catholic Reporter Endorses Women's Ordination- Correct an injustice: Ordain women." "The call to the priesthood is a gift from God. It is rooted in baptism and is called forth and affirmed by the community because it is authentic and evident in the person as a charism. Catholic women who have discerned a call to the priesthood and have had that call affirmed by the community should be ordained in the Roman Catholic church. Barring women from ordination to the priesthood is an injustice that cannot be allowed to stand. This story appeared in the Dec 7-20, 2012 print issue under the headline: Correct an injustice: Ordain women." When thinking of the numerous stories to share, I realized that my grandfather, lovingly nicknamed G-man by my brother, Danny, and I, would have undoubtedly and inevitably told a story about Ireland. Most of his tales took place in old Ireland, in Rathdowney or Coolkerry. They usually involved a few staple characters- Jimmy, who curtly barked and demanded favors of everyone. Little Johnny who whined to his “mam” in the most annoying nasal voice. And Mrs. McCarthy, who still lives just down the road, who wore a shawl and participated in good-natured but silly gossip with a shrill cackle, her words drawn-out and carried a particularly strong Irish accent. I’ll never know if they actually existed in real life…these characters. I never asked because that would have stifled the magic. His elaborations and additions were the best part of every story he told. Charles Haughey Taoiseach once said, “Ireland is where strange tales begin and happy endings are possible.” My grandfather certainly thought so. My childhood revolved around chronicles of temperamental fairies, begrudging leprechauns, mischievous badgers and haunting banshees. Interestingly enough, in his versions, the banshee resembled a ghost with a playful side. I did not learn until years later that banshees possess no such fun streak. Every time Danny and I went to visit, Grandpa would turn off all the lights and don a creased white sheet. For the next half hour, he would chase us around his ranch style home wailing and moaning as Danny, Aunt Mary and I would furiously race and bump through furniture in a fit of giggles, clutching bulky flashlights and turning back time and again to witness the banshee doggedly hovering several lengths behind us. When punishment for capture was exacted, the unlucky child would realize that the menacing banshee was little more than a glorified tickle monster. My grandfather possessed such a passion for life and his vivaciousness lives on in each of our memories. At his grandniece’s wedding in Ireland four years ago, my grandfather was reunited with his younger sister, Tess, and spent the entire service gossiping and giggling with her like a little kid. My aunt Mary, his daughter, shot him her intimidating IHM glare. Not missing a beat, Grandpa tilted his head, smiled sweetly at her and elbowed me in the ribs gently. Unabashed, he then proceeded to make a show of hushing my friend, Ellen, and me, as we were obediently and quietly sitting through the mass, minding our own business. Later in the service, he turned to Ellen and me and inquired rather stridently, “Who is this? I can’t understand a damn word he’s saying? Are you listening? What did he say?” The man in question was his grandnephew who was raised in England and thus, had an English country accent. The man also happened to be the officiating priest at the wedding. Aunt Mary stared at him incredulously, open mouthed, as Ellen and I burst into a fit of laughter and my Great aunt Tess shared a conspiratorial smile. Who wouldn’t have fallen in love with him at that moment? He was the pure embodiment of life, love and good old Irish humor. But what story about Jack Meehan would be complete without a mention of music? His storytelling prowess was matched and exceeded only by his musical abilities. Even as young children, we sat on a mountain of pillows for hours, transfixed by the majesty of a wrinkled, old man swaying to the notes from a brassy, old trumpet. When I hosted pool parties for my middle school friends, I paraded him around like a celebrity, suggesting and even demanding old tunes and classics for him to play on command. I remember Danny and I showing him off to our classes on Saint Patrick’s Day at school, “Notice the Irish accent, it’s real” “Say something, Grandpa!” “Play When Irish eyes are smiling!” The chatting and playing would stop as soon as the music began; the world came to a standstill every time he gingerly lifted that trumpet or sax to his dry, pursed lips. He really came to life playing his music. His cloudy gray eyes began to twinkle and glitter as his knobby fingers glided effortlessly up and down the horn with two or three efficient flicks of the wrist. The passion, respect and love he shared with the world every waking moment of his life emanated from his horns. You can still hear it on old recordings if you listen closely enough… it’s still there. He was an amazingly gifted man. My grandfather had an uncanny knack for storytelling, a gripping and powerful control over music and a compassionate heart. Each and every one of his numerous gifts shared one common bond: the ability to brighten someone’s day and spread joy to all those around him. Today, I shared a few stories about my grandfather with you because above all, he taught me of the importance of a well-timed pause, an arsenal of adjectives and a strong hint of humor. A long, long, long, long, long time ago my grandfather told me a story. A story that has been engrained in me- has become a part of my very existence since he first uttered those oft-repeated words. This story was not of one particular, singular experience, but rather was the history of my family, the heritage of his dreams and a testament to enduring love. I’ll cling to his stories because they are and always will be my favorite part of him. I can’t promise to pass them ALL along or retell them with such vivacity and flavor but just knowing and appreciating them should be enough to honor him and those who passed on before him. I wish I had more time to share these stories with you. I wish he could say a few of his wonderful words. But his memory is served well by your love and support. I don’t know how you all will remember him but I’ll never forget that lilting Irish accent, those smiling Irish eyes and these wonderful stories- his present, past and future- which I now must call my own.